As relations with the island national of Cuba softens and Spring Training comes to a close for the Dodgers in Arizona, the Historic Dodgertown website put together a timely article that focuses on the Dodgers history of playing in Cuba during Spring. You can check that out here. Prior to making Historic Dodgertown, Vero Beach, Florida their Spring Training base in 1948, the Dodgers trained in Cuba three times, including in 1947. Then Dodger President Branch Rickey sought an isolated location to accommodate Jackie Robinson, the player who would courageously break the color barrier in Major League Baseball on April 15, 1947. From 1900, the Dodgers gained popularity in Cuba, as they frequently played exhibition games there. In 1941-42, the Dodgers held Spring Training camps in Havana. Cuba’s rabid baseball fans appreciated colorful Dodger players like Van Lingle Mungo, Pee Wee Reese, Dolph Camilli and Leo Durocher. Colorful is putting it lightly. No doubt, there a more than a handful of "adult-styled" stories of Dodger misadventures on the island. Unfortunately, the article at the Historic Dodgertown website doesn't go into any details. Nevertheless, it's informative and a good read for Dodger history buffs. BTW, several years ago I interviewed Jim Vitti about his book "Brooklyn Dodgers in Cuba." He provides background on the Dodger exploits on the island. You can check that post out here. Another great thing about the article at the Historic Dodgertown website are the handful of vintage photos that they share; including a pic of several Dodgers shooting guns with Ernest Hemingway. 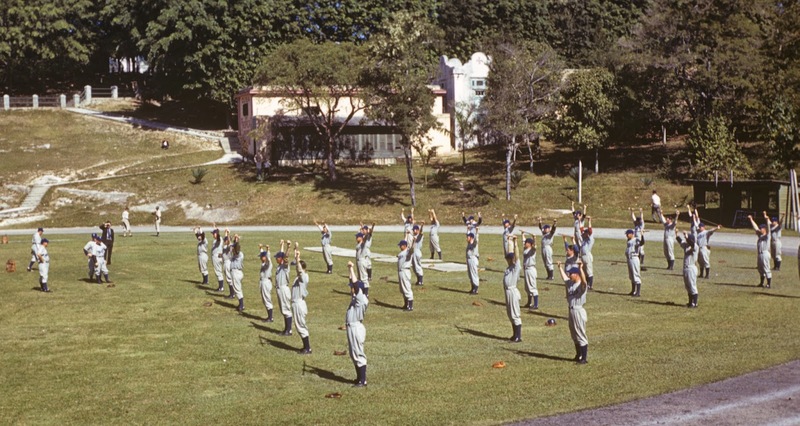 At the very top, the Brooklyn Dodger players loosen up for another day of Spring Training at Cerveza Tropical Stadium. The stadium in ballplayer jargon, “played big,” as it was reported in the New York Herald Tribune that center field was 505 feet from home plate. 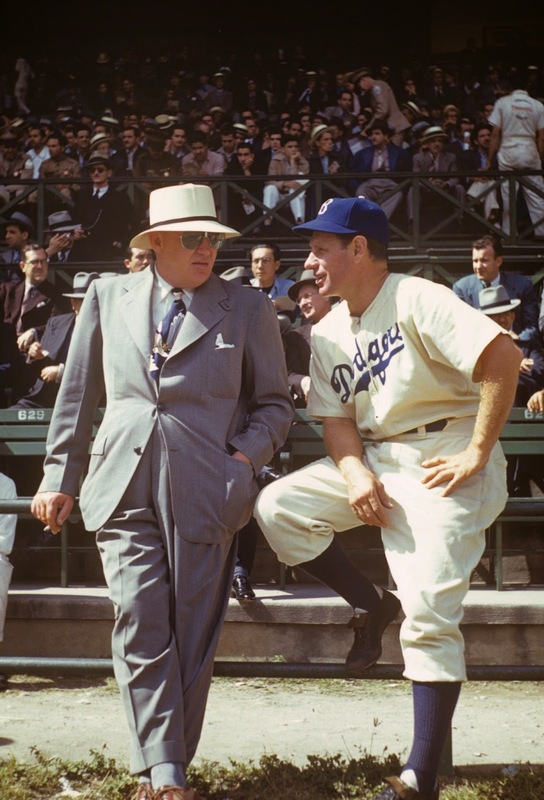 Below is Dodger President Larry MacPhail (left) and Manager Leo Durocher in Havana. MacPhail, the man who first brought stadium lights for a night major league baseball game in Cincinnati, was president of the Dodgers when they won the 1941 National League pennant, their first in 21 seasons. Durocher managed the Dodgers to the 1941 pennant and was later a coach on the 1963 World Championship Los Angeles Dodgers team. 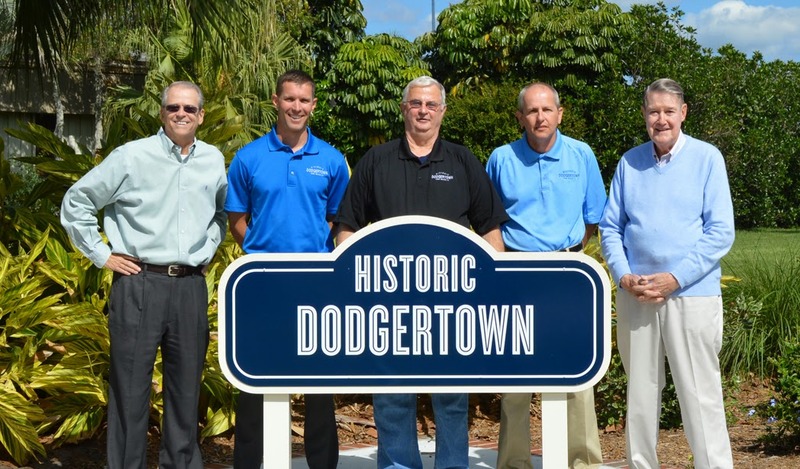 (L-R) Historic Dodgertown Vice Presidents Craig Callan, Brady Ballard, Steve Snure, Jeff Biddle and Historic Dodgertown Chairman Peter O’Malley outside the conference center at Historic Dodgertown – Vero Beach, FL. BTW, History Dodgertown announced today that Steve Snure and Jeff Biddle have each been named Vice President, Historic Dodgertown. “Steve Snure is in his 27th year at Historic Dodgertown, starting in 1988 as executive chef during Spring Training for the Dodgers,” said O’Malley. “Steve’s duties expanded to operations manager six years ago and he has always handled his added responsibilities extremely well. Congrats, guys. One of these days I'll have to venture out to Vero Beach and check out the old place. It's been years since I've visited and I sorely miss the place.